Aqualand Frejus in France for First Place in "Europe's Best Thrill Water Slides" for Polin's King Cobra.Aqualand Frejus was the first park in France at which a King Cobra was installed. 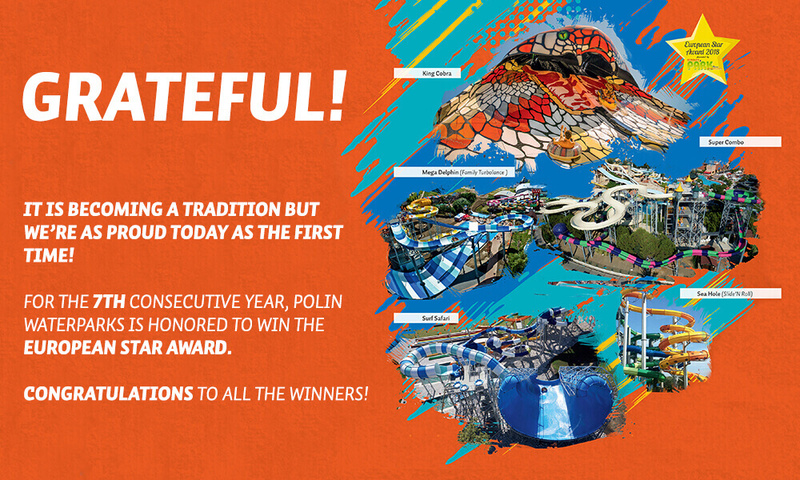 The park continues to expand every few years with Polin Waterparks signature slides, the most recent being Storm Racer. "Polin is now proud to have its own Storm Racer as a ride for adrenaline seekers in Aqualand Frejus. This is a high-end ride" explained Sohret Pakis. Other Aqualand facilities at which Polin has installed attractions are Aqualand Cap d'Agde, Aqualand St. Cyprien, Aqualand St. Cyr Sur Mer, Aqualand Maspolamas and Aqualand Bassin d'Arcachon. Tatralandia Aquapark in Mikulas, Slovakia for Sixth Place in "Europe's Best Family Waterslides'' for Polin's Family Turbolance." The Family Turbolance at Tatralandia Aquapark is the first Family Turbolance in Europe. It is a high capacity ride for 4-6 people. Since 2012, the European Star Award has been bestowed on the eve of the Euro Attractions Show, and has established itself as the most important award in the European theme park industry in a very short time. This year, the organization celebrating the 7th edition in a row and during this period the award has become Europe's most important award for the leisure industry. This award is dedicated explicitly to the European theme park industry, bringing attention to entrepreneurial courage and innovations.